-LaPorscha.. -17 ((11.o4.1992)) -iM blACk -Y3SS iMA BiG GURl... -q3t Al0NG WiT EVERYON3 -lUViNG -CARiNG -HON3St -O ld3St Uf 4..WHiCH SUKS.. -lUV SK3Wl -12th GRAd3 -iStAY iN l0UiSiANA.. -lYK3S: 'PiNk..PURPl3..CHiN3S3 fUUd..tXtiN..GOiN tO CHURCH..ND MUCH MORE!!! 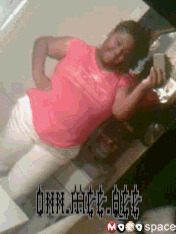 -ASk fUh iF YU WANNA kNW MOR3..iM ACtUAllY k3Wl iF YU G3t tU kNW M3...!! !